AML ™ THERMO HEAT® FAT BURNING PROTEIN† is an advanced scientifically designed protein and amino acid drink. As part of a calorie-restricted diet and exercise (aerobic and resistance training) program, it can help enhance fat loss and preserve lean body mass when following a low-calorie, low-carbohydrate or ketogenic diet. A healthy weight loss is one that enhances the reduction of body fat and preserves lean body mass while dieting. AML™ THERMO HEAT® FAT BURNING PROTEIN† contains a thermogenic blend of whey protein and leucine. 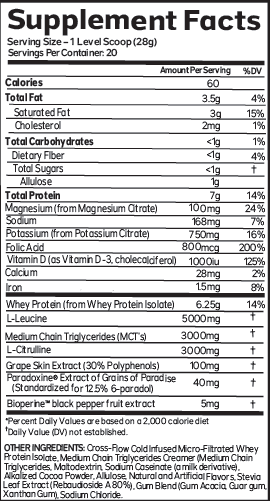 It also contains nitric oxide activators (L-Citrulline, grape skin polyphenols and folic acid). Nitric oxide has been shown to enhance brown adipose tissue (BAT) activity and thermogenesis. Medium-chain triglycerides (MCTs), grains of paradise (40mg - standardized for 12% paradol, a clinically effective dose) and Bioperine® black pepper fruit extract are all included for further activation of BAT and thermogenesis. Allulose is added as a natural, low-calorie, fat-burning, thermogenic sweetener. It is approved for low-sugar/low-carb or ketogenic diets. Alluose does not impact blood sugar or insulin levels. Potassium and magnesium citrate are added as important electrolytes and acid buffers (alkalinizers) when following low-carb and ketogenic diets. Low-grade chronic acidosis, dehydration, electrolyte (mineral) loss and kidney stones are more prevalent in those people following a low-carb or ketogenic diets. 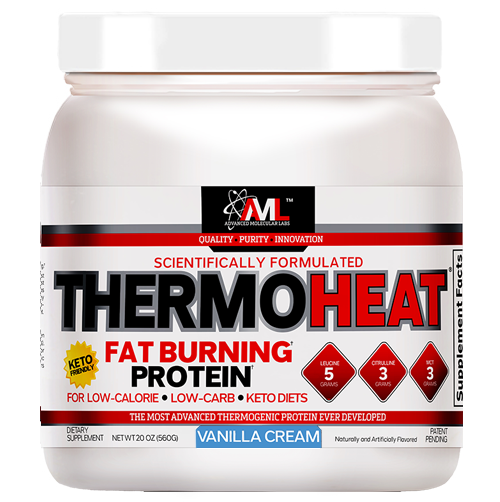 AML™ THERMO HEAT® FAT BURNING PROTEIN† contains a thermogenic blend of whey protein and leucine. It also contains nitric oxide activators (L-Citrulline, grape skin polyphenols and folic acid). Nitric oxide has been shown to enhance brown adipose tissue (BAT) activity and thermogenesis. Medium-chain triglycerides (MCTs), grains of paradise (40mg - standardized for 12% paradol, a clinically effective dose) and Bioperine® black pepper fruit extract are all included for further activation of BAT and thermogenesis. Allulose is added as a natural, low-calorie, fat-burning, thermogenic sweetener. It is approved for low-sugar/low-carb or ketogenic diets. Alluose does not impact blood sugar or insulin levels. Potassium and magnesium citrate are added as important electrolytes and acid buffers (alkalinizers) when following low-carb and ketogenic diets. Low-grade chronic acidosis, dehydration, electrolyte (mineral) loss and kidney stones are more prevalent in those people following a low-carb or ketogenic diets. AML™ THERMO HEAT® FAT BURNING PROTEIN † does not contain pure ketone supplements such as beta-hydroxybutyrate (BHB.) Ketone supplements in the form of BHB salts and ketone esters only provide a temporary increase in blood ketone levels. Ingesting exogenous ketones may briefly interrupt your body’s natural production of ketones. Ketone supplementation reduces lipolysis and free fatty acids availability and may inhibit the body’s natural ability to burn its own body fat for fuel. Medium-chain-triglycerides (MCTs) naturally increase the production of ketones and stimulate ketogenesis. Research has shown that MCT supplements do not cause feedback inhibition and, or reduce ketone production. MCTs also enhance fatty acid oxidation, fat-burning, energy expenditure, and thermogenesis. 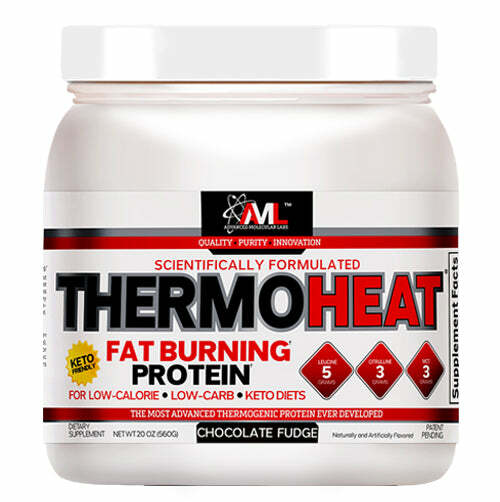 AML™ THERMO HEAT® FAT BURNING PROTEIN † can be taken after a workout or as a meal replacement. It can also be taken 30 minutes before a meal, or any time throughout the day as a low-calorie protein-staring anabolic snack to help preserve lean body mass during dieting. It can also be added to a cup of hot coffee. For optimum results, take AML™ THERMO HEAT,® THERMO HEAT® NIGHTTIME, AND THERMO HEAT ® MULTI capsules daily as part of a caloric-restrictive diet and exercise (aerobic/resistance training program). WARNING: Not recommended for anyone under the age of 18 or if you are pregnant or nursing. Check with your physician if you have a medical condition or before beginning any diet or supplement program.